On Wednesday 16th, nearly three hundred female athletes took on the popular Purple Ladies 5k road race in Ballymoney, hosted by Springwell Running Club and sponsored by the GES Group. Following on from her recent win at the Giants Trail Race, in-form athlete Sarahjane Guiney (Unattached) led the field from the start, quickly establishing a comfortable lead which she maintained to win in a time of 19.20. The remaining podium places were contested by Karen McLaughlin (Springwell Running Club), Veronica Nellins (Unattached) and Lisa Simpson (Acorns AC). Karen’s recent good form and experience proved the difference and she took second place in 20.14, with Veronica third in a time of 20.38. Lisa finished fourth in 20.54 before Nicola Sargent (Termoneeny RC) completed the top five in 21.40. Race Director Kenneth Bacon, Veronica Nellins (unattached), Sarahjane Guiney (unattached), Karen McLaughlin (Springwell RC) and Mr R Paul from Grants Electrical Services LTD.
2nd Karen McLaughlin 20.14, 9th Caroline Crawford 22.09, 11th Lynne Young 22.59, 12th Charlotte Conerney 23.08, 18th Pamela Howe 23.34, 26th Kirsty-Lee Greene 24.40, 27th Louise McDonnell 24.51, 30th Patricia Craig 24.56, 31st Janet Patrick 25.04, 32nd Sophie Moore 24.59, 36th Abby Tutty 25.10, 37th Grainne Moore 25.06, 40th Alison McAllister 25.20, 41st Alanna Millar 25.18, 42nd Holly Clarke 25.31, 44th Mary Brogan 25.30, 45th Carolyn Crawford 25.28, 46th Betty - Ann O'Kane 25.28, 49th Liz Dowey 25.43, 50th Nicola Stewart 25.48, 54th Donna Costello 26.14, 55th Bridgeen Canning 26.21, 57th Rosemary Mellon 26.36, 58th Melanie Millar 26.31, 63rd Laura Wilson 26.46, 64th Ally Kelly 26.47, 66th Jodie Patterson 27.00, 67th Ingrid Hamilton 27.01 PB, 70th Elaine Montgomery 26.52, 71st Margaret Kearney 26.54, 76th Jennifer Allen 27.17, 77th Caitriona Mackle 27.09, 78th Sharon Bingham 27.15, 79th Hayley Neely 27.17, 84th Kate McNicholl 27.41, 85th Rebecca Donaghey 27.37, 91st Emma Elder 28.01, 101st Martina Wade 28.29, 103rd Noelle Watterson 28.42, 104th Paula Morgan 28.47, 105th Roisin Walker 28.43, 106th Catherine Byers 28.40, 117th Michelle McManus 29.12, 120th Stephanie Lynch 29.23, 121st Roberta French 29.11, 122nd Barbara Ferguson 29.32, 127th Eimear Quinn 29.46, 129th Ester Crawford 29.53, 131st Jennifer Moore 30.00, 132nd Lauren Crawford 30.00, 138th Amy Dobson 30.29, 139th Amanda Scott 30.22, 145th Emer Thompson 30.52, 148th Monica McClenaghan 30.54, 149th Paula Chartres 30.54, 150th Lorraine Abernethy 31.05, 157th Mariette Mulvenna 31.36, 158th Caoimhe Armstrong 31.35, 160th Donna McGlinchey 31.39, 164th Siobhan McIntyre 31.48, 169th Lyn Graham 32.16, 180th Wendy Doherty 32.17, 184th Caroline Owen 32.33, 203rd Mairead McNicholl 34.34, 205th Lyn Gordon 34.38, 207th Claire Crawford 35.20, 217th Hannah Smyth 36.33 PB, 218th Victoria Smyth 36.35, 222nd Lauren Anderson 37.45, 232nd Stacey Montgomery 40.47. The Extreme North Quadrathon took place from 17th – 20th August consisting of four marathons and half marathons on consecutive days. While the distances covered are challenging enough the scenic, rugged Donegal landscape of the Inishowen peninsula make the event just that bit harder. Springwell RC’s Nicola Frizelle, returning to competitive running after injury took on the challenge of four half marathons in four days. On day one the race started on the west of Inishowen above Kinnego Bay and finished in Malin Town. Day two saw the runners climbing the roads around Malin Head to finish back in Malin Town. Day three took the runners through the scenic but arduous climb of Mamore Gap before finishing in Buncrana. The final day saw the runners running through Muff Village to finish at the Redcastle Hotel. Nicola had four fantastic races finishing 13th on day one in 1.45.13 and on day two she finished 10th in 1.47.11. The challenge of the Mamore Gap saw a slightly slower time of 1.52.00 and 12th place but, saving the best for last completed her fastest race of the event on day four in 1.39.38 and 10th place. In the final results Nicola had a cumulative time of 7.04.02 which saw her finish 10th overall and 2nd in the ladies race. This year Extreme North added a new race to the event known as the ‘Hero’. The Hero is a 105 mile race following the course of the four marathons from Moville around Malin Head, through Buncrana to Muff and the Redcastle Hotel. Starting at 2.30pm on Saturday 19th August competitors were allowed a maximum of 26 hours to complete the run. Springwell RC had two members who were prepared to put their toe to the start line for this monster of a challenge. Helena Dornan, despite illness after 12 hours of running, continued running to finish as 1st lady and 5th overall in a time of 23.12.23. Alistair Shaw, having completed 98 miles of running was so physically and mentally exhausted that he had to retire just 7 miles from the finish. Springwell RC’s Helena Dornan – winner of the ladies race at the Extreme North ‘Hero’ 105 mile Ultra Marathon. On Saturday 19th August, mountain runners from all over Northern Ireland took on the latest round of the NIMRA Championship, the Slieve Bearnagh Mountain Race, hosted by Mourne Runners. The race covered 3.9 miles in distance and incorporated 2,680ft of ascent – it’s classed as a ‘short’ race for the Championship. The classic mountain race took in Slieve Meelbeg, Slieve Bearnagh and Slieve Meelmore, in that order with athletes starting and finishing in Happy Valley (top of the Trassey Road). Springwell RC’s Colin Brennan finished 24th in 1.01.29 (5th MV50). 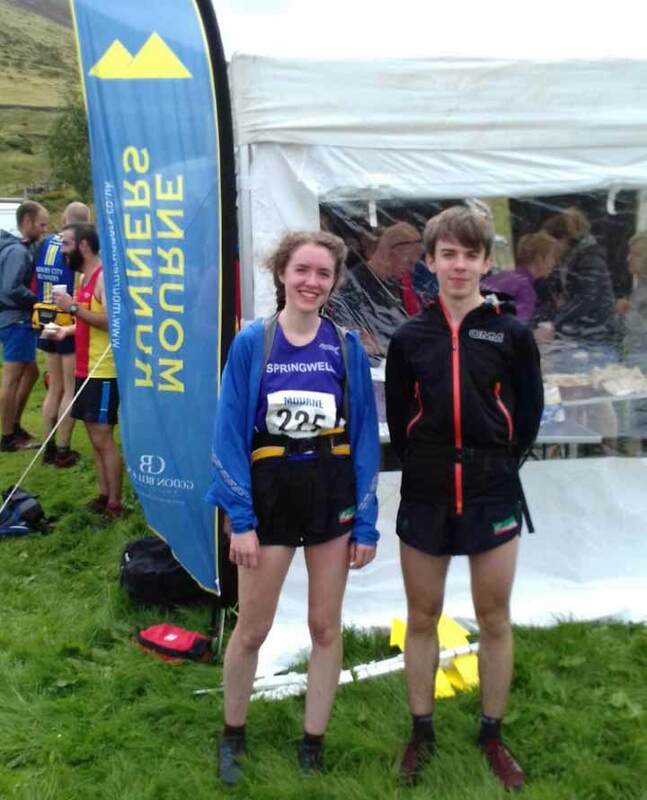 The junior race was to the summit of Slieve Meelbeg and back and, continuing their excellent mountain running form from earlier in the year Springwell RC’s Oisin and Molly Brennan won their respective races, which were also trials for the Junior Home International Mountain Races. Sunday 20th August saw the Letterkenny Marathon and Half Marathons take place in Donegal. Springwell RC had two representatives in the Marathon with Jeff Young finishing in 3.34.45 and Will Colvin, in his very first marathon recording 4.11.11. In the Half Marathon Timothy Bacon crossed the line in 1.40.00. On Saturday 19th August almost 300 athletes made their way to the picturesque Silent Valley in the Mourne Mountains for the Dambusters Half Marathon and 10k, hosted by local events management company Born 2 Run. Springwell RC’s only representative at the event, Janet Patrick had an excellent run in the 10k event finishing 89th in a time of 51.49 and 2nd in the F55 age category by only 3 seconds. This weekend Springwell RC had 54 members out and about in 6 different Parkrun venues with 3 new personal bests being recorded.